So, cool story… my husband David works with Brandi’s mom and she mentioned that her daughter was looking for a wedding photographer. Since David is my biggest fan, he gave her my information, she gave it to Brandi, and I soon became their wedding photographer! How cool is that?! She might have never found me if it wasn’t for that connection. Fast forward several months and we’re at their wedding at the Shark’s Tooth Golf Club in Panama City Beach on a perfect, sunny day in November. This venue is stunning! I loved the Harry Potter vibes that I got from the dark wood accents and hanging pendants. What I loved most about this reception space though were the white walls! They photograph so well compared to dark walls and the wooden beams really complimented them well. 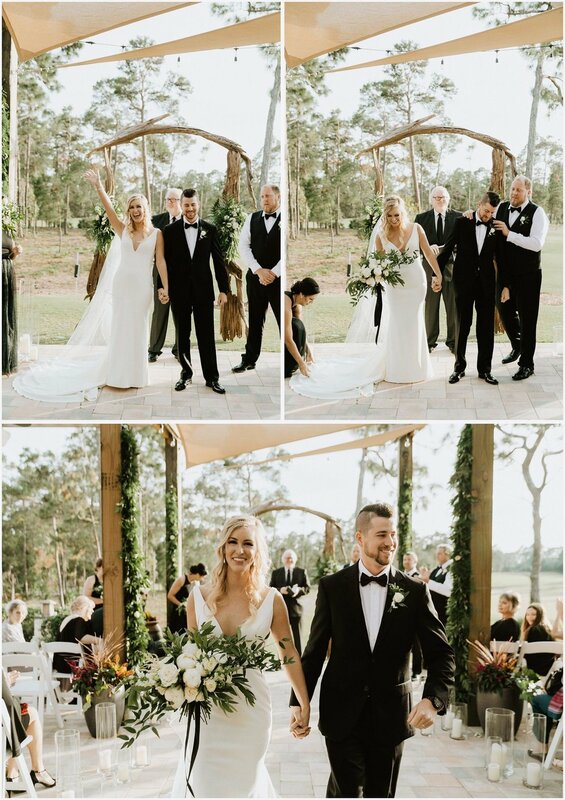 The ceremony was held under this beautiful pergola lined with candles and garlands and the golf course provided the perfect backdrop. With so many beach weddings, it was really nice to photograph an event in such a green environment. My favorite moment of the ceremony was seeing Kamen’s reaction when he saw Brandi in her dress for the first time walking towards him. It was such a sweet moment and it brought tears to my own eyes. A close second favorite would be when the best man pretended that he lost the ring and then that it wouldn’t come off his finger. 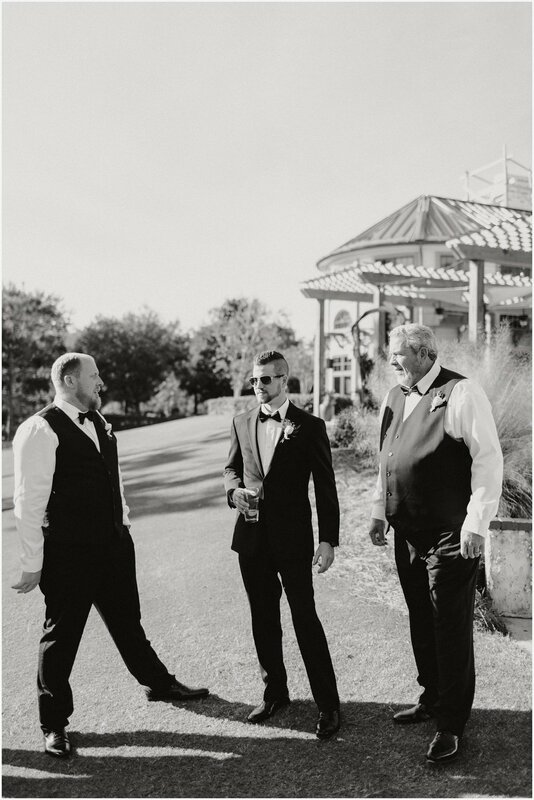 Classic best man prank! After the ceremony, guests enjoyed a cocktail hour in the venue while we took some more photos. 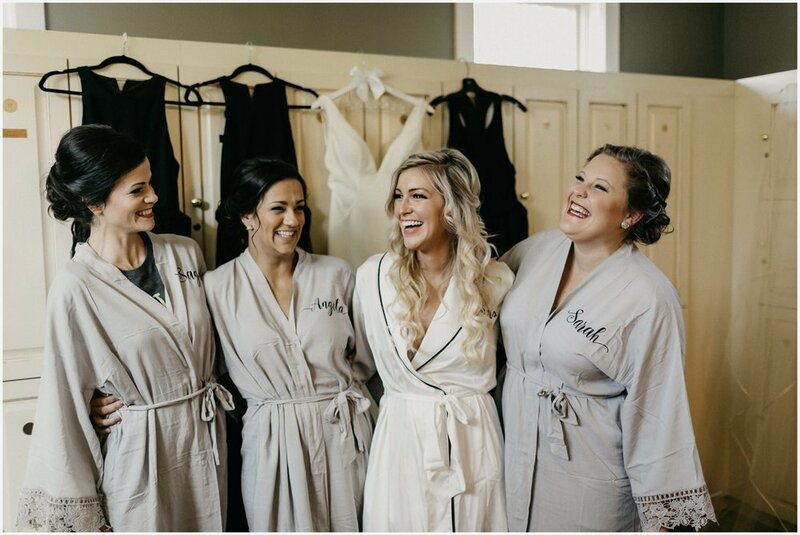 The wedding party was such a fun group with lots of laughter and cutting up. 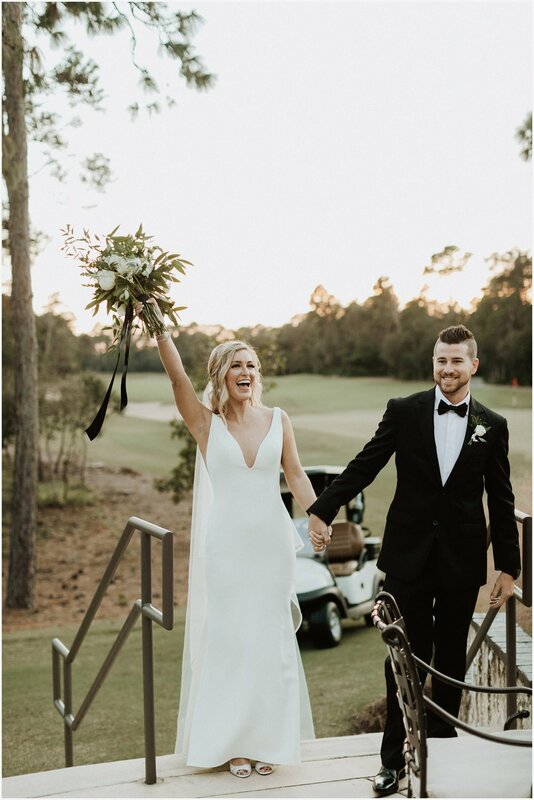 Afterwards, we took a couple golf carts to the end of the golf course where we were greeted by a gorgeous, golden sunset for their couple’s portraits. I also loved the simplicity of the black and white color scheme that they went for with greenery spread throughout. Very classic and timeless. I always look forward to speeches at weddings. There’s usually that one guy that has the whole room in tears cause they’re laughing so hard, but this wedding has 3 people bringing it! The reception was just as fun too. People were dancing like crazy and one of the staff members even joined! Btw, if you’re looking for an alternative to a sparkler exit, keep scrolling to check out their petal toss exit and Kamen showing off his new bling! Love these two so much and so happy that I was able to be there to capture it all. 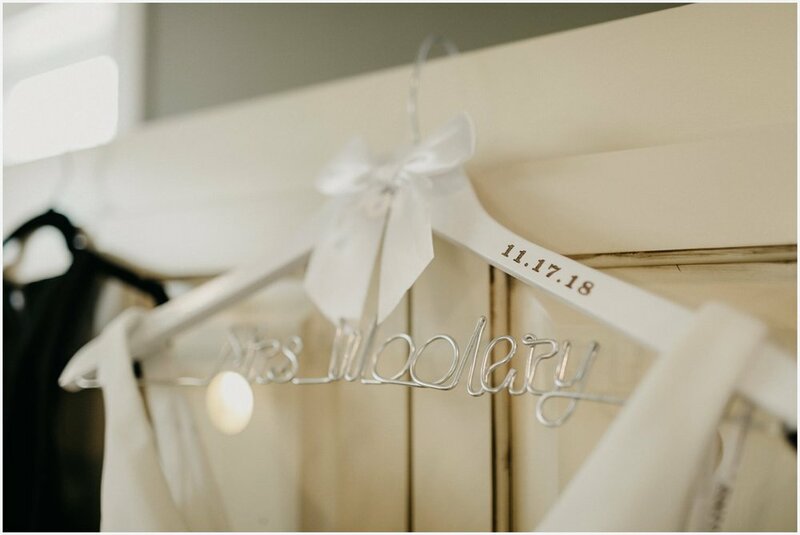 Need help planning your wedding exit? Check out my helpful blog post here.